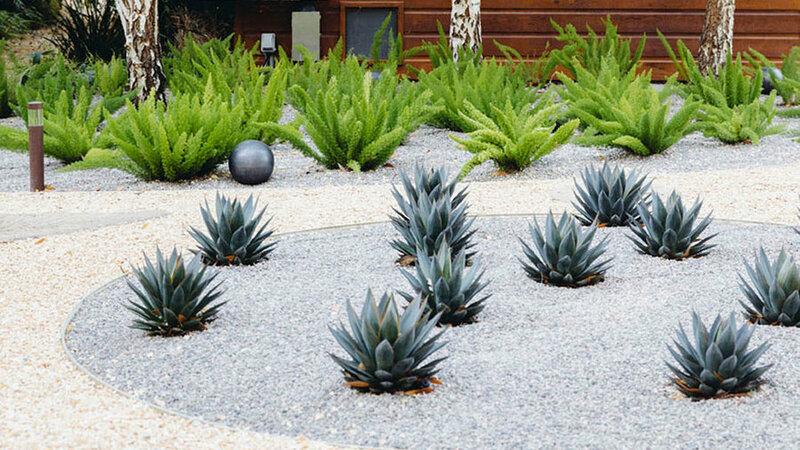 In this Menlo Park, CA backyard, agaves (A.‘Blue Glow’) in the circular bed—edged with almost-invisible black steel—are widely spaced to show off their structural shapes (this also allow room for growth). Inside the circle, crushed gravel in grey further helps set apart the planting from the otherwise buff-colored gravel of the pathways. Succulents are just a part of this garden. Behind the circular bed, a trio of lacy-leaved birch trees provides the perfect veil of privacy for the master bath. Architect Keith Willig planted asparagus ferns (Asparagus aethiiopics ‘Myeri’), which have similar water needs, underneath. Design: Keith Willig Landscape Architecture and Construction, Menlo Park, CA; . 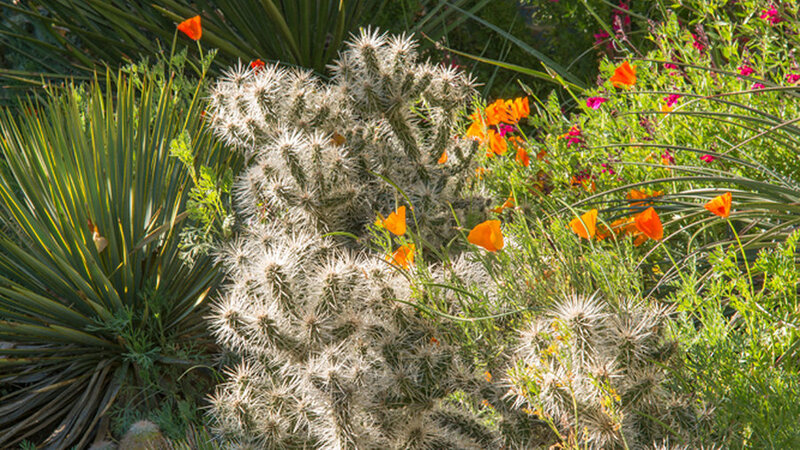 Though cholla spines are sharp as can be, their appearance of glowing in the sun makes them a star in a garden. Here, in the Fort Collins, CO home of designer Lauren Springer Ogden, a petite form of cholla (Cylindropuntia whipplei 'Snow Leopard') absolutely glows—as if they have auras—at dusk. Adding to the scene are the bright, ephemeral blooms of orange California poppies and pink Salvia greggii 'Wild Thing'. 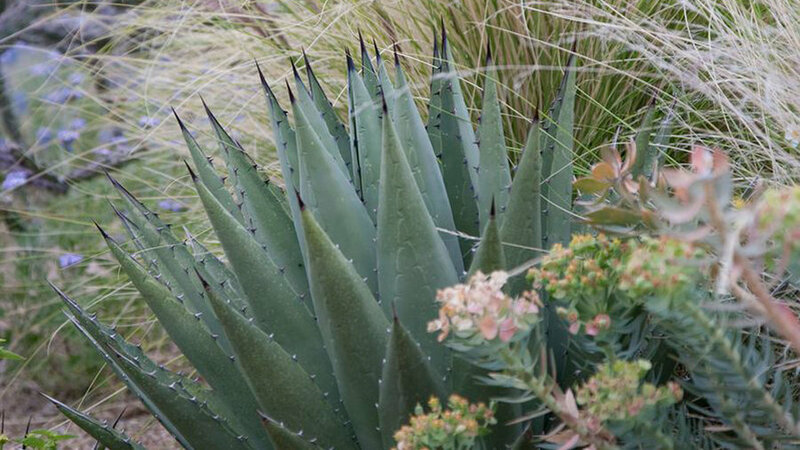 A handful of yucca, including Y. thompsoniana, miniature Y. harrimaniae, and a hybrid yucca in back, add year-round structure with their sword-like leaves. Design: Lauren Spring Ogden, Plant Driven Design, Fort Collins, CO; . Columnar cactus boast a tall, narrow footprint, making them perfect to hide a fence line or act as a divider for outdoor rooms. They need the bare-minimum of water and take next to no maintenance. 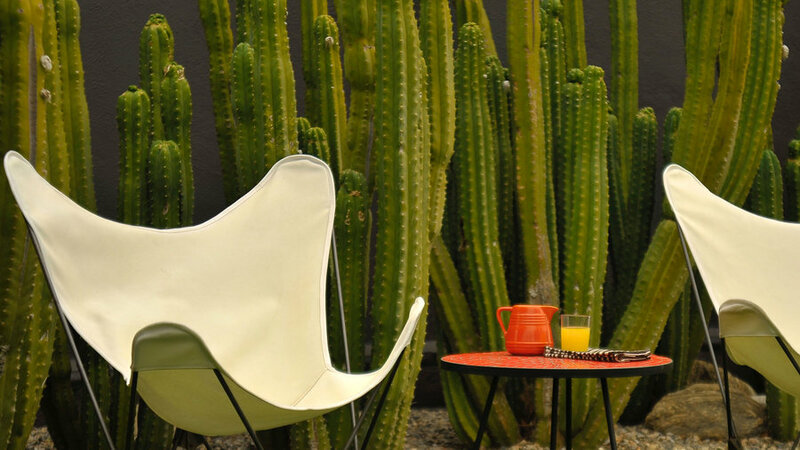 Here, tall columns of Pachycereus marginatus create a dramatic backdrop for stylish butterfly chairs and The Midge Table (both available from ). 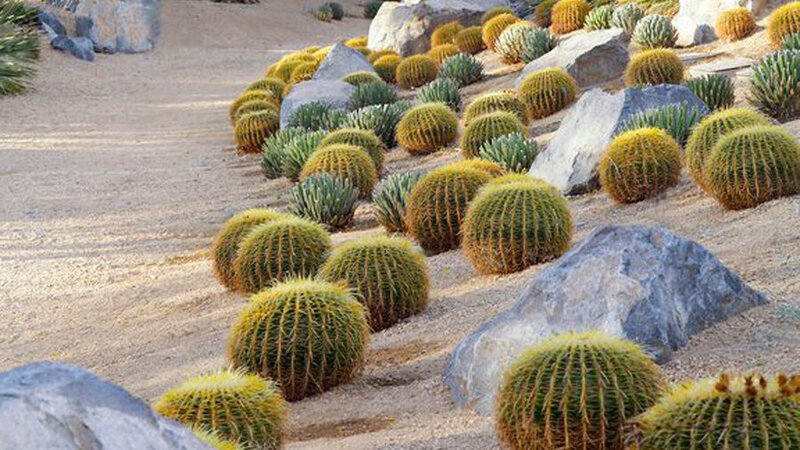 To extend the natural feel of the desert into the garden of this Tucson home, landscape designer Elizabeth Przygoda-Montgomery mimicked the surroundings, mi prickly and pillar-like plants with soft and shrubby ones. 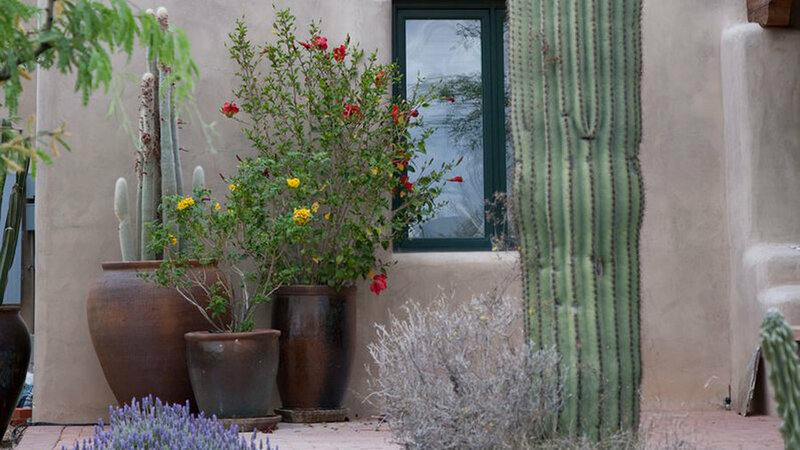 Saguaro cactus and Agave parryi add structure and texture in front of the patio, while pomegranate, yellow rose and lavender add “Monet-inspired” color throughout. 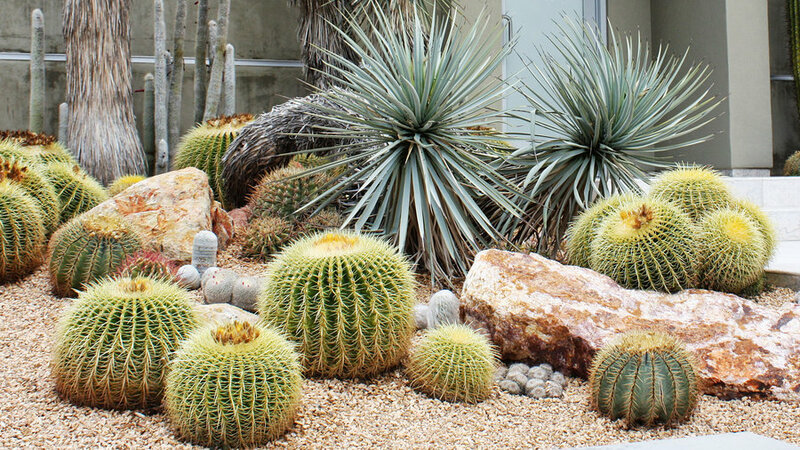 The potted cacti also add structure to the space, and a native velvet mesquite tree lends a feather canopy. The scene is as easy on the eyes as it is on the irrigation and upkeep—a once monthly cleanup does the trick, and only the trees and pots need supplemental water, and only during the hottest time of the year. Design: Elizabeth Przgoda Montgomery, Boxhill Design, Tucson, AZ; . Muted colors of teal, purple, and soft green visually cool down the desert heat and allow the textures to shine in this Tucson landscape. Feathery fountain grass (Pennisetum) adds softness behind a spikey artichoke agave (Agave parryi 'Huachucensis') and provides a natural transition to the grassland beyond. 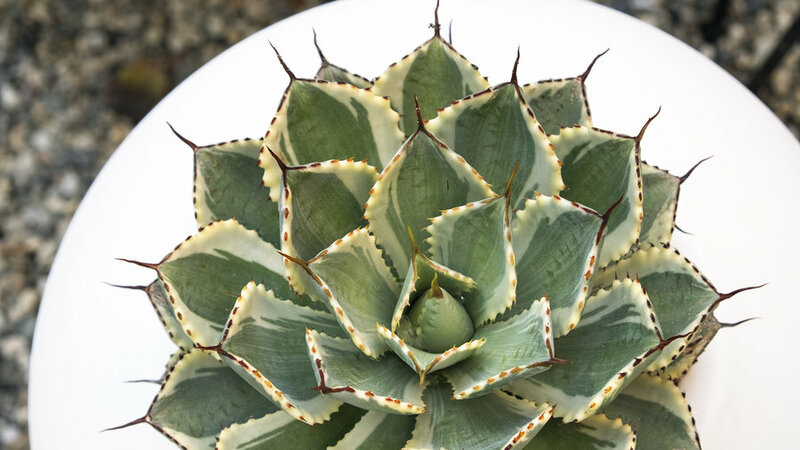 To achieve this subtle look, designer Elizabeth Przgoda recommends looking for plants “in Monet’s color palette” whose soft tones complement the natural landscape. 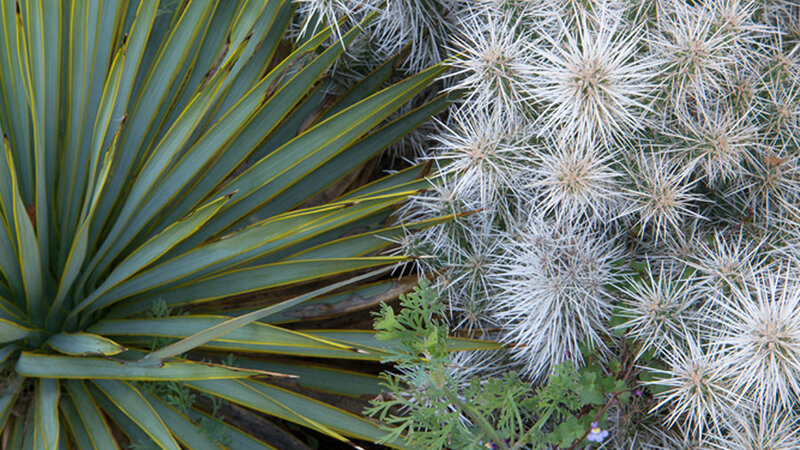 The grasses and agave need little care and the blossoms on the Euphorbia rigida blossoms in the foreground can be trimmed after they bloom or left to fade for added interest. Design: Elizabeth Przgoda Montgomery, Boxhill Design, Tucson, AZ; .